Eric Ries is an entrepreneur, speaker and well-known writer of several books and the author of the popular blog Startup Lessons Learned. He is the co-founder of IMVU, his third startup where he has served as CTO. In The Lean Startup Ries uses first-hand ascertainments in the successes and failures of his own startups which has led to the formation of the Lean Startup. 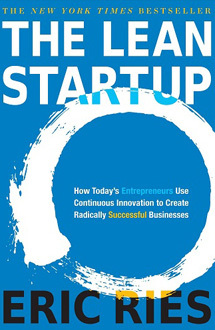 Using the author’s definition of a “startup” gives the needed basis to proceed to not only the definition of the “Lean Startup” but the explanation of answering the “what” question of what is it. In order for entrepreneurs and those who hold them accountable to be successful one must be mindful of the five principles that encompass the Lean Startup. Entrepreneurs must be willing to do the research, plan and forecast in order to be successful. Entrepreneurs are everywhere. Anyone can be an entrepreneur. It’s not just those operating out of their garages it’s anyone that works to develop new products or services despite the uncertainties and risks. Entrepreneurship is management. Startups are born of innovations and uncertainties requiring a new type of management willing to dream outside the box and take risks. Validated learning. Startups are not just to make money, build products or serve customers, but also to learn how to build a viable business. Build-Measure-Learn. The concept of a startup is turning ideas into product, customer respondence, determine how to go forward and finally learn from the process. Than start again. This is the very core of any startup process. Innovation accounting. This covers the boring yet important steps of measuring progress, setting goals and prioritizing the work. With startups this requires a new kind of accountability. While being mindful of the five principles one must execute the trilogy plan of the “Lean Startup” which consists of “vision, steer and accelerate” meanwhile always using the “build-measure-learn” to keep moving forward. The goal of any startup is finding that perfect niche. Finding that customer need that they are willing to pay for, than creating the innovation and development to meet that need. One must not only have vision, but also customer insight, ambition and ability all consecutively than execute. Ideas are executed, data and feedback is collected and analyzed to determine is the product valuable and how or if a startup should proceed with it. This data helps to determine which direction to “steer” next using the “build-measure-learn” process. Ideas have been executed, feedback is successful now is the time to determine the release – to go big or go small. The who, what, where, when and how questions must be answered in order to maximize the chance of success. Over thinking this process could lead to failure. Timing is everything. Anyone knows that startups come and go. Promising ideas at the perfect time, an excellent team, up-to-date technology does not always equate a great company. Research, planning and execution of the five principles and the “Lean Startup” creates lessons to be learned throughout the process from vision to execution. In building startups never stop learning and growing yourself and your product. The five principles of entrepreneurship and the “Lean Startup” must go hand-in-hand to create a successful team in order for a startup to succeed. Masterfully executed the “Lean Startup” doesn’t necessarily lead to a perfect startup, as in any startup there is trial and error. Nevertheless, there is always lessons to be learned which is the real key to success – never stop learning and asking questions to make a great startup even more successful. However, using the “Lean Startup” is the wave of the future for entrepreneurs everywhere.